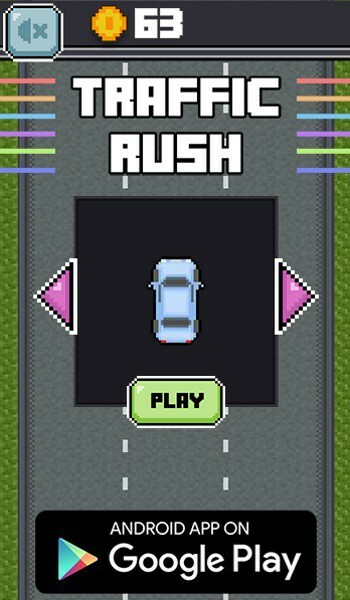 Traffic Rush : Retro Racing by Imperious Interactive is an addictive, easy-to-play arcade game with classic retro art. It's rush hour again and you're not really the patient kind. Dominate the roads and show them who's boss! An addictive, easy-to-play arcade game with classic retro art. Drive fast amidst the traffic without crashing to race yourself and your friends to the best score possible. 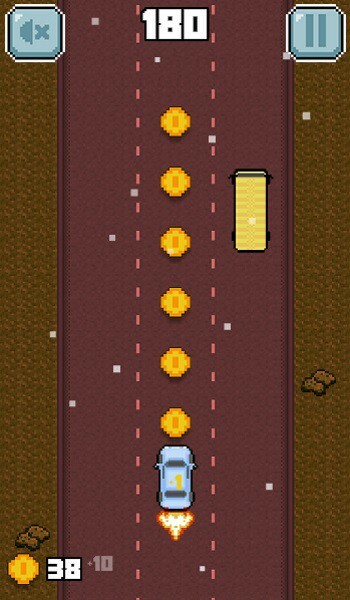 Collect coins and unlock up to 9 super awesome vehicles in the game. Get better cars to dominate your friends on the leaderboard. Master your skills and fight for the top ranks among the elites in the world! Google play services integrated so that you can stay connected every game. Boosts: Get yourself some boosts in-game for an unfair advantage over the less unfortunate blokes on the road. Power-Ups: Pick up power-ups on the roads to give yourself a quick boost from the traffic. Unlockables: Collect coins to unlock an array of cars and other vehicles which are distinct from each other in terms of performance, score and coin picking abilities. Challenge all your friends in your social circle and compete against the best of the players from around the globe to fight for your place on the global leaderboards. 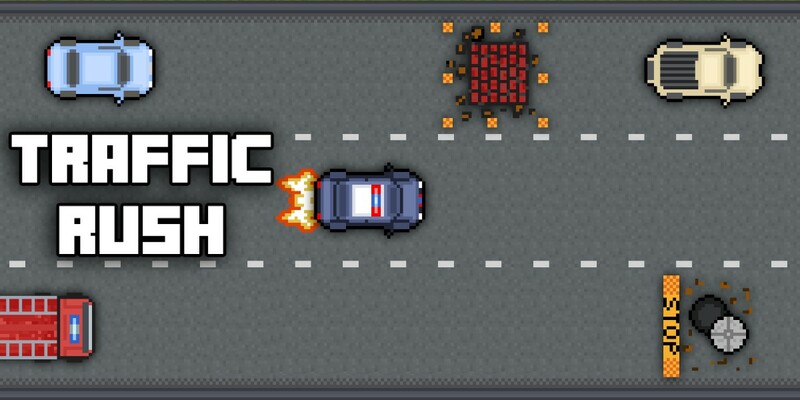 Traffic Rush : Retro Racing is a retro endless racing game that is simple to play and, more importantly, fun! The game starts slowly, but it picks up speed quickly as you reach more and more points. 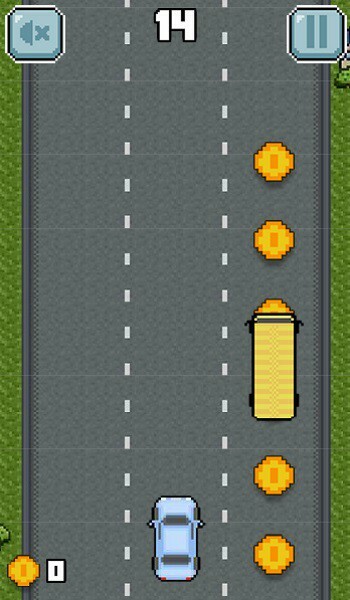 Along with speed, you will see more items on the screen such as highway gates, power-up and coins. When you reach certain speed, the highway gates becomes nearly impossible to avoid. But the good thing is that you are allowed to break the gate at a cost of -10 points. Other obstacles such as other cars, bricks and man-hole (at least, that's what I think it is), should be avoided completely. The power-up works like an invincibility mode where you zoom pass through traffic, moving automatically choosing the best path possible. It is fun while it last, but you must prepare for the stop and immediately switch lane if you see an obstacle in front of you. There are a decent amount of upgradables available to unlock and some are only available on mobile version. So, if you like the game, the mobile version definitely worth checking out! Overall, Traffic Rush : Retro Racing, with its retro look, is one of those racing game that I enjoy. It's a great quick pick-up-and-play game. Recommended!